At restaurants throughout the world, menus feature ``Maine lobster," that sweet, succulent stuff that makes grown people don bibs and make a delicious mess. Like Idaho potatoes, Vermont maple syrup, and Florida oranges, Maine lobster has become a name brand. The state produces 75 percent of the lobster catch in the United States, and it brings a premium price, both at the docks and on the table. But are you really getting Maine lobster, or is it what some Mainers call an ``impostor lobster," from Canada or elsewhere? Under a new program that kicks off today in Portland, lobster dealers will be encouraged to tag the catch, identifying it as being caught in Maine waters. 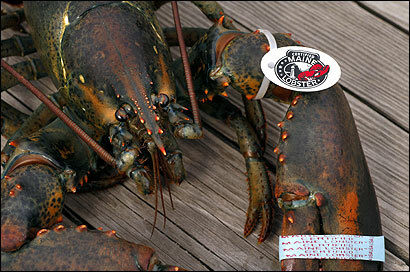 The plastic tags will hang from the claw knuckles and state simply: ``Certified Maine Lobster." On the front will be a picture of a lobster and a lighthouse; on the back, ``lobsterfrommaine.com." At a press conference, Governor John Baldacci will tag the first ``official" lobster, caught in Casco Bay. Because of increasing competition from Canada, the Maine Lobster Promotion Council is having to market a product that's been a mainstay of the state for centuries, and whose iconic crustacean image graces the state's license plates. ``We hope every lobster caught in Maine waters will soon be wearing these new ID bracelets," said Kristen Millar, the council's executive director. ``It's truth in advertising. All lobsters are called `Maine lobsters' and yet they're not all from Maine. It has become this generic term, like Kleenex." ``Don't buy impostor lobster" is the campaign slogan, which will be printed on all sorts of items, from lobster bags to placemats. The program will be voluntary, dependent upon everyone from the dealers who buy lobster off the docks for resale to retailers or processing plants. John Hathaway, a lobster dealer and processor who owns Shucks Maine Lobster in Richmond, loves the idea. ``We have the best lobster in the world, and we need to let people know what they're getting." What they're getting, he said, are environmentally sustainable creatures carefully harvested by experts. ``It's not some big trawler out there dragging the bottom. These are guys who go out and they take them by hand, only take the right size, and they place them down carefully. There's a lot of TLC involved." Maine's new tagging program won't change Canadians' habits, but officials are hoping to raise awareness among US consumers. If the program works, customers will be able to determine whether the lobster they're buying is really from Maine. Ultimately, the state's fishermen say more local processing plants need to be built to support an industry that last year harvested 65 million pounds of lobster, for sales of $300 million. Naturally, if you ask anyone in Maine, its lobster is vastly superior to Canada's. Michael Gagne is chef/owner of the Robinhood Free Meeting House, a five-star restaurant on Georgetown Island. He'll use only local lobster, which he said is incomparable. ``Most of Maine lobster tends to be softshell so it's easier to eat, not so fibrous, and is sweeter," he said. But chef Jasper White, who owns four Summer Shack restaurants in the Boston area, said he uses lobsters from Canada and Maine, as well as other New England states. For him, it's not a matter of which is better, but which is available. ``If people come in here in February and ask for Maine lobster, I'll tell them to go wake up the lobstermen and the lobsters, because the lobsters go dormant in winter," said White, who wrote the cookbook ``Lobster at Home." Canada has the majority of the North American market, said White. He added that he's glad Maine is starting to market its product. ``For rolling up your sleeves and enjoying steamed lobster, you can't beat Maine lobster in the summer." Maine lobstermen and dealers tend to be an independent lot, and supporters of the tagging program hope they'll cooperate. ``The quintessential symbol of independence in this area of the country is the Maine lobsterman," said Gagne. ``And that is both the boon and the bane. They need to work together because this is a global marketplace." Millar recently sent a letter to Maine lobster dealers, explaining the program and asking them to sign an agreement that they will participate. Once they do, they'll receive the tags and other promotional materials. But once the lobster leaves the dealer's hands for a fish store or a restaurant, it's the honor system: What's to stop a retailer from advertising his Canadian lobster as Maine lobster? ``We will hear through the grapevine, through the marketplace . . . . We are going to be very aware of those folks who say they're serving it, but they're not, and we'll make a big deal out of it," stressed Millar.